Page F30: Where is the best place in Europe to familiarize oneself with most languages? 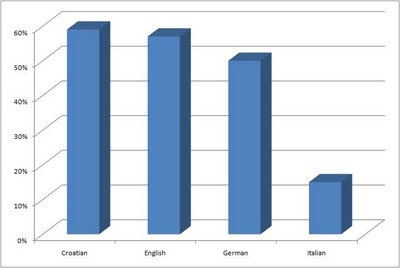 Where is the best place in Europe to familiarize oneself with most languages? The short answer to this is: in the biggest cities where you can find the most people from every ethnic background. But there are certain disadvantages to learning languages outside their country of origin, namely the fact that there is no way to completely immerse yourself in one for days and weeks at a time, and also that you will usually have to bargain to use a language: either paying for lessons, or offering to teach something in return, or simply finding a group of people that don't particularly want to use English. Whatever the case, it takes a bit of strategy. Going directly to a country, on the other hand, will mean that everywhere you step you will find a speaker of the language. No strategy required besides going there in the first place and having a way to stay for the long term. Familiarizing oneself with as many speakers as possible in Europe first means three things: learning a Germanic language, learning a Romance language, and learning a Slavic language. Finding the ideal place would mean somewhere all three of these can be learned within a short distance, and maybe another one or two on top of this. Many will say that basically anywhere in Europe applies, but this isn't quite true: while it's technically possible to live in Berlin and take the train to Poland or France within a few hours, the distance and cost is still great enough that you won't want to make such a trip every weekend. At such a distance everyday life tends to get in the way, and after a few months or years you realize that you spent most of your time in one place and hardly got to travel at all when it came down to it. There are exceptions, but most end up like that. So where is the best place? 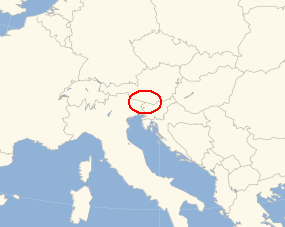 The most obvious location would be somewhere from northeast Italy to south Austria to anywhere in tiny Slovenia. Germanic, Romance and Slavic all within 100 km of each other. Where is this place? Right around here. Hungary is also close by. Nowhere else offers such close contact with so many language families. Switzerland has four official languages but three of these are Romance, western Romania has Romance and Slavic and Hungarian in close proximity but Germanic is farther away, Estonia has Estonian/Finnish and Russian and Swedish and Baltic but no Romance (one family but a lot of countries), and other locations are also similar to these. So I suggest central Slovenia to southern Austria as the best place to familiarize oneself with the greatest amount of language families in the shortest distance possible. Any thoughts?